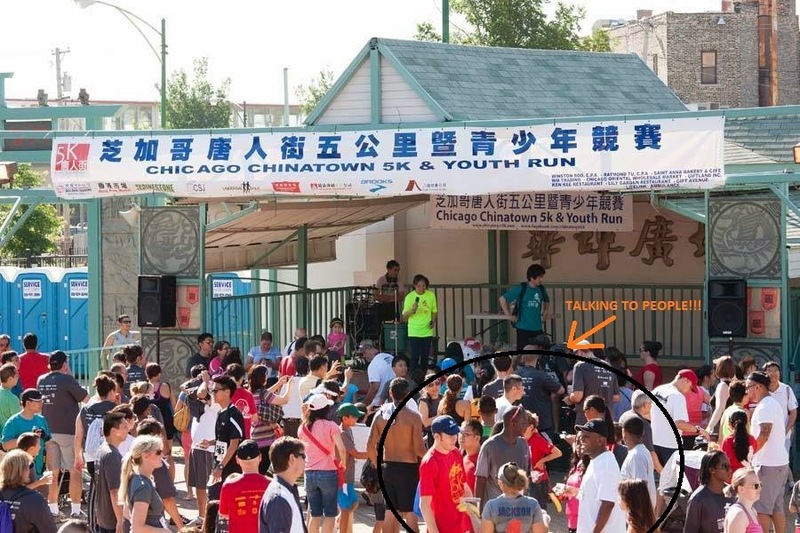 I just found this photo from last year's Chinatown 5K on the Chinatown 5K Facebook page and it so perfectly sums up my impression of myself at every race I run. I am wearing a nerdy race bib belt. (This thing looks sillier every time I see it in a picture but it is so convenient that I can't stop using it. It is the fanny pack of running gear). There is a big group of people next to me standing in a circle with their backs to me. They are all wearing the same shirt (not the one I'm wearing). One of them is looking at me like, "WTF is up with that guy?" Still... lest I give the impression that I never talk to people, here's another photo from the same Facebook page of the same race. I'm definitely conversing with other runners here... total introversion averted! I get you. When I go to races, I am totally the awkward girl standing on the side, wishing someone would talk to me, lol. Excellent post Zach! Mo, you are not alone. All my students tell me I "mean-mug" them when I'm teaching. I bet I do the same at the start line, but I really am a nice guy. Happy running! I loved last year's Carrera de los Muertos so I had to sign up again this year. I got a ride down to Pilsen with Fuzzy and Erica (because they're super-cool and because Pilsen is not the easiest place to get to from Lincoln Square without a car). We got there with plenty of time to spare, which was lucky because we actually needed all that time to park the car and get a parking slip and all that. We ended up getting to the starting line just about five minutes before the race started. Luckily, the gear check for this race is impeccable and once I had my bag checked I think there was still about three minutes before start time. 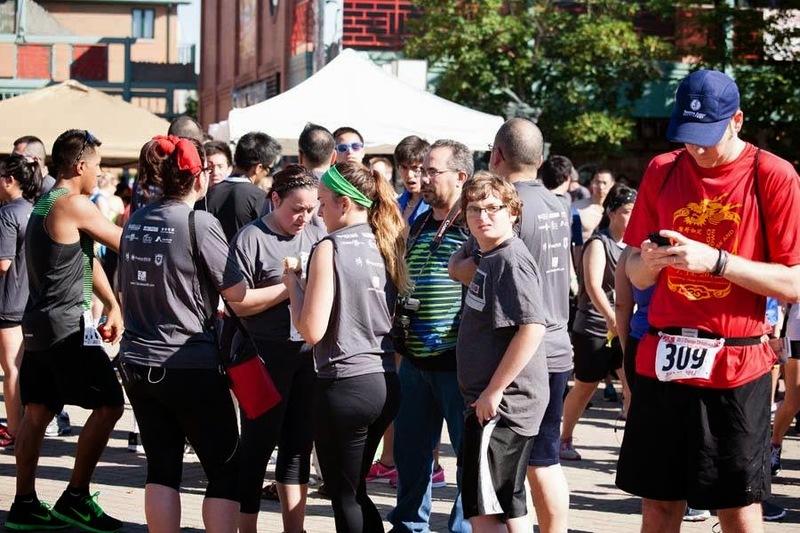 So I stood around looking at all the scenery: with the sweet costumes and bright purple race shirts, along with the (artistic) graffiti on a lot of the walls along the course, I think Carrera de los Muertos has to be the most colorful race in Chicago. Hosted by Chicago comedian Big Keef, this weekly comedy showcase (recently relocated to Rockin Horse Saloon & Grill in Oak Forest) has been running for more than five years. This bi-monthly showcase consistently lands top-notch headliners, has an amazing following and always delivers. This show features an impressive line-up and closes out with Chicago great Chelsea Hood. This killer comic was on "Last Comic Standing," is a frequent guest on Howard Stern and is in town for seven shows over four nights at Zanies. A Cinco de Mayo show one day early and all in Spanish. Featuring Jaime de Leon and Sonal Aggarwal. Actor and comedian H. Jon Benjamin makes a stop at Wilson Abbey on his book tour. The latest entry in the Character Assassination roast show series pits a collection of Disney princesses -played by Chicago comics - against each other. Starring Allison Dunne, Alex Kumin, Sarah Shockey, Gena Gephart, Audrey Jonas, Eunji Kim, Samantha Berkman, Stephanie Weber and Mandee McKelvey. A weekly open mic open to all forms of comedy that takes place at a sweet venue in Bucktown. This free two-hour comedy showcase is hosted by Darrick J and Nate Galloway. Comics get between four and 10 minutes each and the hosts let comedians know a bit needs work by hitting a bell and "shaking 'em up."